An upright bike will allow you to train and exercise without leaving your home. 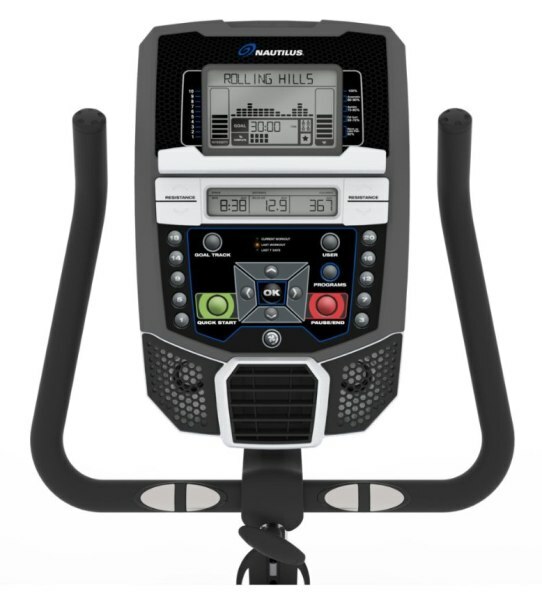 Modern upright bikes now come with sophisticated training programs that can help you improve and track your fitness. 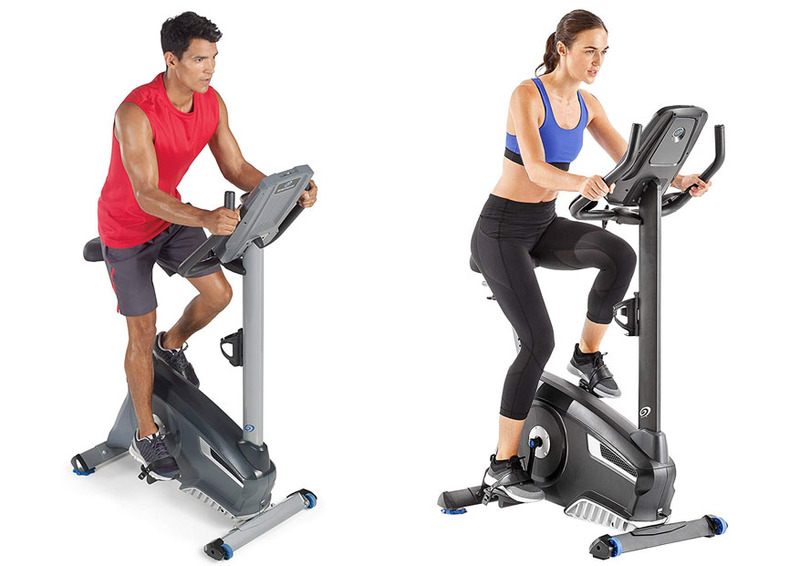 Below, we will discuss the comparison between Nautilus U6114 vs U616, two upright bikes from the same company. Which one is better for the money? As a matter of fact, Nautilus U614 and Nautilus U616 have similar dimensions. Each of them measures 41.5” x 23” x 12.75”. Nautilus U614 weighs 68.1 lbs, and Nautilus U616 weighs 68.6 lbs. The weight difference is very marginal. See also: PowerBlock vs Bowflex 3.1 Bench. However, there are actually several notable differences in the design and construction. First of all, although both models have adjustable seats, Nautilus U614’s seat can only be adjusted vertically for the height, whereas Nautilus U616’s seat can be adjusted vertically and horizontally to allow a more precise and comfortable position. Most people are fine with Nautilus U614’s seat, but if your body is significantly smaller or larger than the average, Nautilus U616’s seat will be more comfortable. Second, Nautilus U614 vs U616 have different cranks. Nautilus U614 comes with one-piece cranks and straighter crank arms. It is certainly quite durable. However, if your foot size is 10 or larger, your heels or ankles may hit the crank arms if you don’t adjust your feet. Nautilus U616 comes with three-piece cranks that are more durable to withstand heavy resistance levels. The crank arm design is better, as the crank arms won’t get in the way of your feet. Third, Nautilus U614 does not have elbow pads, while Nautilus U616 comes with elbow pads. This does not seem like a major difference, but the elbow pads are definitely very nice. The elbow pads allow you to lean on the handlebars without causing pain to your forearms. Fourth, Nautilus U614 only has standard LCD screens, whereas Nautilus U616 comes with backlit LCD screens that are easy to read in any lighting condition. Both models have USB ports that are useful for charging your smartphone or music player. You can also use the USB port to plug a flash drive to save your last workout session so that you can upload it later. Nautilus U614 does not have built-in Bluetooth. So, it mainly relies on the USB port for connectivity. This is a bit inconvenient because you need to upload your workout sessions manually if you want to track your performance. Nautilus U616 has built-in Bluetooth. This is very convenient. 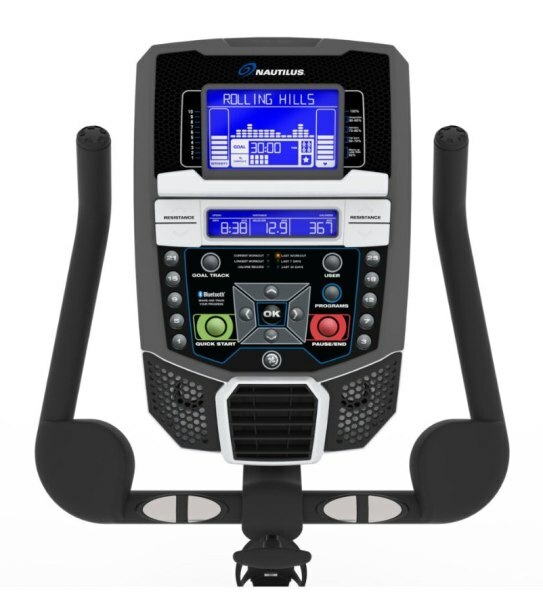 You can connect your smartphone or tablet via Bluetooth so that the upright bike can sync automatically with the Nautilus Trainer 2 mobile app. If you want to track and evaluate your performance over time, Nautilus U616 is definitely very useful. The built-in Bluetooth also allows you to sync with the RideSocial mobile app. It is pretty cool because it allows you to see the world while virtually riding with your friends in real-time. Both Nautilus U614 vs U616 can track your heart rate. But Nautilus U614 is only able to perform heart rate monitoring through the hand pulse sensors. In other words, you need to continuously hold the handlebars in order to allow the heart rate monitoring to work. Nautilus U616 is more convenient because, in addition to the hand pulse sensors, it can also work with a heart rate strap. Although the heart rate strap needs to be purchased separately, this is still very nice. Using a heart rate strap is more convenient because you don’t need to hold the handlebars continuously. Nautilus U614 comes with 20 resistance levels. The performance is very good. It is powered by a high-speed, high-inertia drive system featuring a perimeter-weighted flywheel. The resistance is smooth and always consistent. The different levels from the lightest to the heaviest can suit people of any physical type and skill. Nautilus U616 comes with 25 resistance levels. However, the resistance range is similar. It also uses the same drive system and perimeter-weighted flywheel, so the performance is also smooth and consistent.The lightest and heaviest levels are similar to those of Nautilus U614. The additional levels simply add smaller increments. As the effect, the transition is smoother and more natural. Nautilus U614 only has 22 built-in training programs. There are 9 profile programs, in which the resistance levels change over time. There are 8 heart rate programs, in which the resistance levels change from time to time to maintain your heart rate. There are 2 custom programs, 2 fitness tests, and 1 quick start program. Nautilus U616 comes with a total of 29 built-in programs. It offers 12 profile programs and 9 heart rate programs. The additional heart rate program allows you to choose the percentage of your maximum heart rate. Furthermore, there are 4 custom programs, 2 fitness tests, 1 recovery test, and 1 quick start program. Nautilus U614 only allows you to create up to 2 user profiles. It is good if the upright bike will only be used by you and your partner. However, it doesn’t have a guest mode, so when someone else uses it, the data will be added to one of the profiles. Nautilus U616 allows you to create up to 4 user profiles for tracking heart rates, calories, and fitness. This is great. It doesn’t have a guest mode, but you can dedicate one of the user profiles for guests. So, when someone else wants to use it, they won’t mess up your data. All in all, Nautilus U616 is much more recommended. This model is better in many aspects. It has a more adjustable and comfortable design. The build quality is better with more durable cranks. It has built-in Bluetooth, more training programs, and more user profiles.